Are Two Bedroom Condos a Better Investment Than One Bedroom Condos? Question: Is it true that two-bedroom condos are a better investment than one-bedroom condos? Answer: If you’re asking this question strictly as an investor, the answer is purely based on the numbers. If you’re buying for yourself, you’ll want to consider appreciation as well as what makes the most sense for your lifestyle. For example, do not spend an extra $150,000 because a two-bedroom will appreciate faster, if you’ll end up using the second room for storage and an occasional guest. 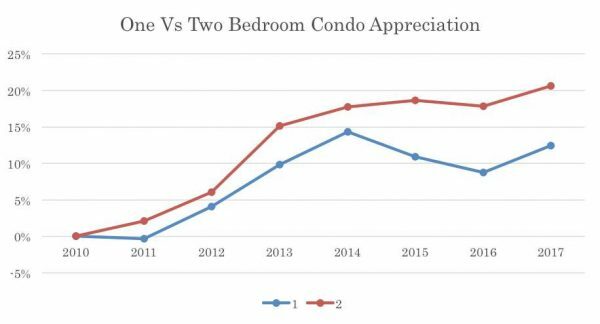 Below is a graph showing appreciation of one and two bedroom condos in Arlington since 2010. To maintain consistency, the data set uses condos built from 2000-2008 limited to one bedroom units with 600-800 sq. ft. and two-bedroom units with 900-1,400 sq. ft. The average one-bedroom sold for $364,000 in 2010 and is selling for $409,000 in 2017 while the average two-bedroom sold for $529,000 in 2010 and is selling for $638,000 today. If you bought the average one-bedroom in January 2010 with 20% down, you’d have approximately $172,000 in equity today. If you bought the average two-bedroom in January 2010 with 20% down, you’d have approximately $294,000 in equity today by putting an extra ~$33,000 down in 2010. If you’re an investor, you’re looking at rental income, in addition to appreciation. 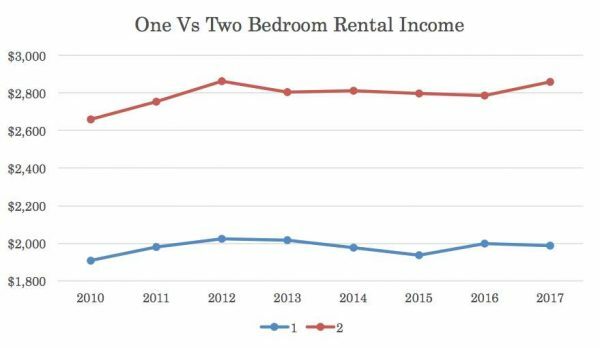 As I wrote this spring, rental rates have been pretty flat in Arlington, especially along the Rosslyn-Ballston corridor, due to a lot of new rental buildings being built the last 5-10 years. Based on the average 2010 purchase prices, rental income and a 25% down payment (most common % down for an investor), the average investor along the Rosslyn-Ballston corridor has no cash flow from their investment. The table below does not include maintenance or property management fees and assumes average condo fees, taxes and insurance. Considering that the above monthly cash flow summary does not include maintenance costs, property management fees or vacancy periods where is the value in owning an investment property? Tax Benefits: Another major benefit of investing are the tax benefits. Being able to deduct expenses like condo fees, tax payments and repairs. As well as depreciate the value of the condo and provide a huge annual financial benefit to off-set the weak monthly cash flow. A one-bedroom investor may be able to deduct about $20,000 per year and a two-bedroom investor about $30,000. Of course, you’ll want to discuss any deductions with your tax professional first. If you’ve invested in property in other areas of the country, you may be shocked by how little monthly cash flow a condo along the Rosslyn-Ballston corridor produces. A major reason for the lower ROI is the lower risk that comes with investing in Arlington condos. Your downside risk during an economic dip is much lower and the rental market is consistently strong with a large pool of well-qualified renters. It follows the basic economic tenets of risk and return. If you’re considering buying an investment property, feel free to send me an email at Eli@EliResidential.com to set-up a meeting to go through your investment goals and options. Newer PostShould You Re-List In The Spring? Older PostHow Much Does Land Cost In Arlington?